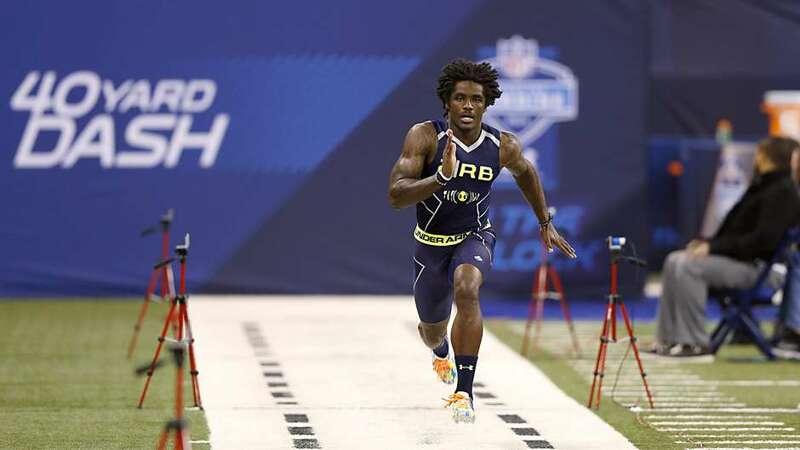 Dri Archer of Kent State ran a 4.26 40 yard dash at the NL Combine. That is the fast 40 since Chris Johnson’s 4.24 in 2008. The 2014 NFL Combine is now in the books. We will give recaps of the players that made money by improving their draft stock. Today we continue on day two of the Combine when the skill players were on display. The last group to compete on day two were the running backs. The value of the running back position has changed over the years. Gone are the days when a running back might be the first overall pick. In the 2013 draft, for the first time in 50 years, a running back was not selected in the first round. The truth remains, however, that you have to be able to run the football to keep defenses honest. Running backs can also be a critical part of the passing game if they can catch the football and pick up blitzes. If you want to be a successful NFL team, you still need good running backs to help you move the ball. Dri Archer – Kent State – (5-8 173 lbs. ): Small but extremely explosive and dynamic with the ball in his hands. Makes cuts at full speed. Very good hands. Able to help out in the return game. With his size, he won’t be a workhorse back, but due to his receiving skills, he could play in the slot as well. Ran a 4.26 40 (Combine best), 6.86 3 cone drill (tied for #4 RB) and 4.06 short shuttle (#2 RB). Vertical jumped 38.0” (tied for #4 RB). J.C. Copeland – LSU – (5-11 271 lbs. ): Former defensive lineman that moved to fullback his junior season. Blows up defenders in the run game. Has softer hands than you would think and is surprisingly nimble on his feet. Had 23 bench press reps (#4 RB). Timothy Flanders – Sam Houston State – (5-9 207 lbs. ): Led his conference in rushing all 4 years and is a 2 time Southland Conference Offensive Player of the Year. A strong lower body with a low center of gravity. Good outlet receiver. Very nice feet. Able to make moves that will remind you of Barry Sanders. Doesn’t have great speed (4.75 40 yard dash), but is extremely quick. Jeremy Hill – LSU – (6-1 234 lbs. ): Big, powerful back that likes to get north-south in a hurry. Has quick feet for a back his size. Has a slashing running style and has the ability to spin out of tackles. Doesn’t have great top end speed (4.66 40 yard dash). Looked good running pass patterns downfield. Carlos Hyde – Ohio State – (6-0 230 lbs. ): Top running back on many boards. Big, strong and powerful. Did not get to do much due to an injury on this first 40 yard dash. Henry Josey – Missouri – (5-8 194 lbs. ): Good speed and quickness. Able to make one cut and burst through the hole. Has a darting running style. Has loose hips that allow him to make quick cuts. Recovered from a gruesome knee injury in 2011. Ran a 4.43 40 yard dash (#3 RB) and a 4.13 short shuttle (#5 RB). Tre Mason – Auburn – (5-8 207 lbs. ): Key to the Auburn offense that played in the BCS title game. Has a low center of gravity and a strong lower body. Runs with good pad level and finishes runs. Very good jump cut that allows him to change direction very quickly. Compact build with nifty feet. Loose hips. Vertical jumped 38.5” (#3 RB) and broad jumped 10’ 6” (tied for #4 RB). Jerick McKinnon – Georgia State – (5-9 209 lbs. ): Measurables blew up the Combine. Versatile player that played QB, RB and CB for the Panthers. Has the ability to return kicks. Freakish athleticism. Had some of his best games against top competition. NFL teams will try to figure out if he is a running back or a corner, but he is someone you have to make room for on your football team. Ran 4.41 40 yard dash (#2 RB), 6.83 3 cone drill (#3 RB) and 4.12 short shuttle (#4 RB). Vertical jumped 40.5” (#2 RB) and broad jumped 11’ 0” (#2 RB). LaDarius Perkins – Mississippi State – (5-7 195 lbs. ): Good straight line speed. Runs bigger than his size. Good acceleration and quick burst. Has a darting running style. Has to slow down to make his cuts. A little bit tight in the hips. Ran a 4.46 40 yard dash (#5 RB). Bishop Sankey – Washington – (5-9 209 lbs. ): Fluid running style. Good balance and flexibility. Nice jump cut and change of direction. Looked good catching the ball. Good measurables. Had 26 bench press reps (#2 RB) and broad jumped 10’ 6” (tied for #4 RB). Ran a 6.75 3 cone drill (#1 RB) and 4.00 short shuttle (#1 RB). Lache Seastrunk – Baylor (5-9 201 lbs. ): Did not run as fast as I thought he would (4.51 40 yard dash). Has quick feet and makes nifty cuts. Strong lower body and has a low center of gravity. Runs behind his pads. Very quick start/stop ability. Catches the ball well. Vertical jumped 41.5” (#1 RB) and 11’2” in the broad jump (Combine best). De’Anthony Thomas – Oregon (5-9 174 lbs. ): Rail thin. Ran a disappointing 4.50 40 yard dash. Outstanding quickness and very good acceleration. Hits the hole quickly and makes his cuts at full speed. Dangerous in the open field. Finds creases and explodes through them. Won’t be able to take a big workload due to his size. Has the ability to return kicks. Andre Williams – Boston College (5-11 230 lbs. ): Led the country with 2,177 rushing yards in 2013. Powerful lower body with tree trunk legs. Nickname is Little Earl due to having the same body type as Earl Campbell. Very good downhill runner. Very good balance after contact with the ability to run over defenders. Lacks the ability to make defenders miss in space. Struggled catching the ball. Ran a 4.06 short shuttle (tied for #2 RB). Vertical jump 38” (tied for #4 RB) and broad jumped 10’9” (#3 RB). This entry was posted on March 9, 2014 by draftmaniacs in All-Star Games and Combine and tagged 2014 nfl combine, 2014 NFL draft, Andre Williams, Bishop Sankey, Carlos Hyde, De'Anthony Thomas, Dri Archer, Jerick McKinnon, NFL, NFL Combine, NFL Draft, Tre Mason.